British documentary photographer Rich Wiles has been based in Palestine for many years. His work explores notions of home, identity, resistance, and has been published and exhibited widely. Here Rich tells us more about his SWPA winning series, 'Circus behind the Wall' and his path into photography. Let’s start with the big question – for you, what is the purpose of photography? Photography is a medium that helps us to question the way we look at the world and what we 'know' or think about it. If photography can make us 'think' differently, then can it also encourage us to act differently? I believe that it can, and therefore the purpose of my photographic practice, unashamedly, is to be an agent for social change in whatever context that is being sought. You have lived in Palestine for many years. What brought you to the country and was photography any influence on this decision? My time at college coincided with the anti-war movement in the lead up to the invasion of Iraq. I was involved in the anti-war movement and it became the feature of my first major long-term project. Once Iraq was invaded I knew that I had to go to document the global and human consequences of decisions made in seats of power. Through the anti-war movement I met a group of activists who were going to Palestine and invited me to join them as a photographer. Those 3 weeks in Palestine in 2003, amidst the Second Intifada, were life changing and my work in Palestine had begun. I made repeat trips in 2004, and by 2005 I was living in Aida refugee camp and running participatory photography projects with children in the camp as well as developing my personal projects. Since then, apart from international exhibition and book tours, or short visits to see family and friends, I have been based in Palestine. Please tell us about your winning series 'Circus behind the wall'. Where were the images shot, what is the circus in the pictures and what was the inspiration for the series? 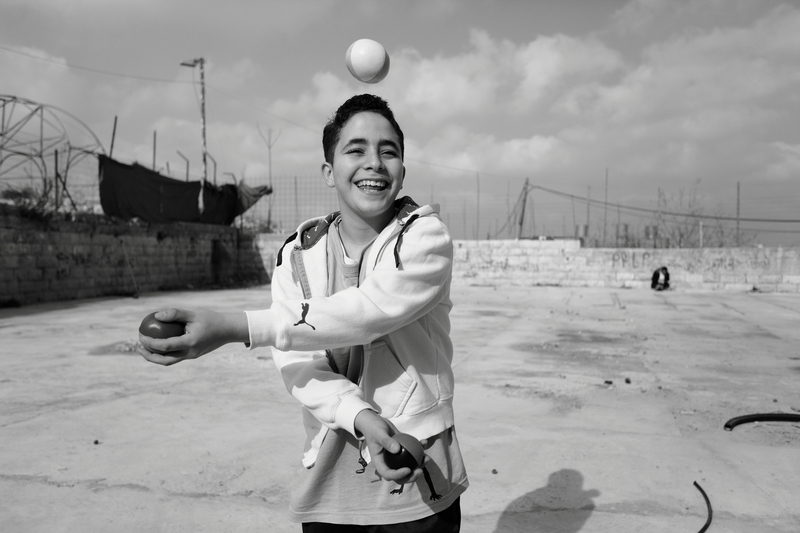 'Circus behind the Wall' explores the work of the Palestinian Circus School - a project that was established by Palestinians in 2006 to teach contemporary circus skills to children and youth across the West Bank. The series was shot at the school's base in the village of Birzeit over the course of several visits to the school. The circus school exudes energy and the movement and shape presents rich photographic opportunities, but the more time I spent speaking to people there different layers began to unravel. Circus has no traditional roots in Palestine so the school's very existence is a reflection of our globalised world, yet the school has found a way to remain firmly attached to its Palestinian context. In its international shows it uses contemporary circus as a platform from which it tells stories of Palestinian life and struggles, but it also brings much needed laughter to many children in its local shows and works for positive societal change within Palestine - it was this multi-dimensional aspect that really struck me. 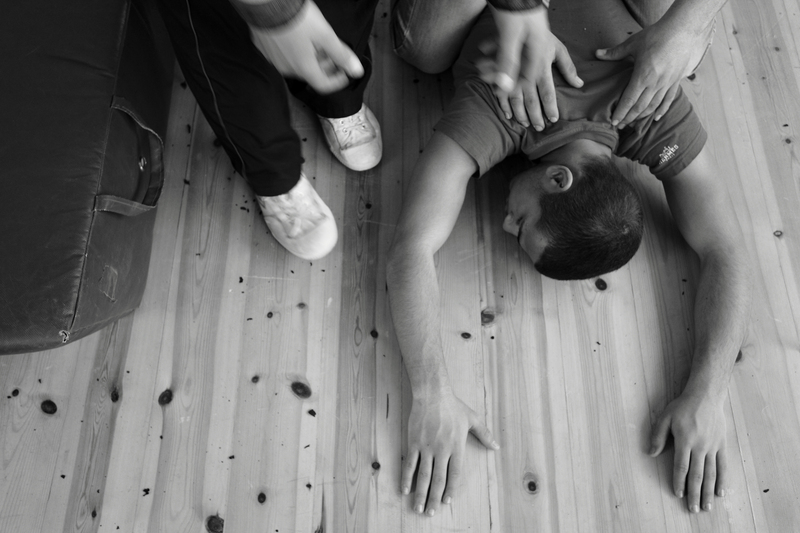 This year the awards received many submissions shots in black and white. Why did you choose to shoot your winning series in this style and is this how you prefer to work? I worked exclusively with black and white film in my first few years in Palestine. Since moving to digital I have done more colour work although my love of black and white remains with me today. It comes down to 'feeling' - if I don't 'feel' my images then they're not working. Sometimes I know instinctively whether a particular project should be colour or mono, but with 'Circus behind the Wall' it was whilst editing the first shoot rather than an initial impression. Stripped back to form and tone the work just 'made sense' to me in mono. Many of your photo essays capture a Palestine that is different to that portrayed in the media, you avoid the violence and hardship which is often stereotyped upon the country and instead focus on smaller, intimate stories. What is it about these stories, which appeal, and how do you find them? Palestinians are generally portrayed in the media as either 'aggressors' or 'victims' - yet outside these stereotypes little is revealed about Palestinians as people and the multiple complexities of daily life. My interest is the context - the moments, days or years before and after the sensational 'media moment' and the wide-reaching relationships between political realities and human experience. I don't avoid violence or hardship but I look for different ways to express it. All of my stories are multi-layered. The circus school for example intertwines political stories and grassroots social work within a contemporary art form. The colour images in my 'Turning the Clock Forward' project are not instantly sad or full of pain, yet they are exploring a story about a community that is struggling against more than 60 years of forced displacement. So the link between political context and human response is always present. The world has changed since the grainy images of the Vietnam War shocked people around the world. The day after the invasion of Iraq began in 2003, I remember overhearing people discussing the TV images of US-UK missiles flying towards Baghdad as though discussing a Hollywood film. I think we have (sadly) become anaesthetised in some ways to images of suffering given the bombardment of imagery in today's world. As a documentary photographer I look for alternative ways to explore the story although all my work remains politically and socially engaged. You have been quoted as saying “Art is a part of a culture of change”. How does photography fit into this statement and how do you personally use art as a tool of change in Palestine? My practice explores various ways that art can be used in a socially engaged context within both personal and participatory projects. My participatory photography work in Palestine began following discussions with volunteers from a youth centre in Aida refugee camp who were interested in using photography with their members. 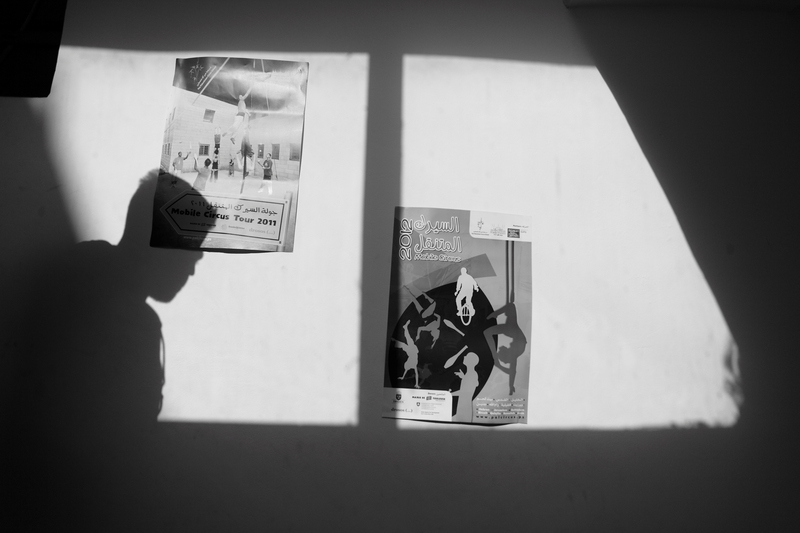 The idea was to use photography as a tool with which refugee children could express themselves and their realities, and to subsequently create exhibitions through which the children could be 'heard' internationally. Photography could then become a vehicle through which these young voices could get past the walls and checkpoints that surrounded them. I continued to develop this project with Lajee Center (www.lajee.org) for several years, working with many children, and producing several collaborative books and exhibitions. Eventually, former project participants became trainers of the next generation. This sustainable element was essential, without it any potential long-term benefits could have been lost if the project fell apart without my input. 'Cameras for kids' type projects have become popular now, yet if used in social contexts I worry about the ethics of some projects which could end up becoming more about the lead photographer and less about real benefit for participants. Work produced by children and youth at Lajee has been exhibited widely around the world and has won various awards, but most importantly continues today. One participant is today doing some press photography whilst others have studied media or art. This model has been implemented within other communities as well. My participatory photography projects are founded in the belief that photography can amplify previously unheard voices and can subsequently be a tool in a much wider process of change. However, I have heard such work described as 'giving a voice to the voiceless' - to me this notion is rooted in cultural imperialism. Everybody has a voice, and people in the majority world do not need do not need a 'privileged westerner' to give it to them. It is 'selective deafness' rather then voicelessness that is the core issue, and if photography can amplify voices and challenge 'deafness' then its role is significant. My 'personal' practice also sees this belief, and human collaboration, as fundamental to its production. In this case I see the collaborative aspect as the time spent away from the camera - listening, talking, sharing. This time becomes equally as important as the split second in which the shutter is released as it is this process which informs photographic decisions. To me these processes become paramount in creating images. Art then builds relationships and communication from which eventual collective action can become part of the process of change. You have written several books about Palestine including “Behind the Wall” (published in 2010) which shares the stories of Palestinian refugees and is accompanied by intimate portraits of those you spoke to. Does writing/storytelling and photography always go hand-in-hand for you? I don't feel that photography and writing need always be used together although sometimes it works. Its all been part of the development of my practice and my experimentation with different mediums. This has included photography, writing, film-making and even collaborations with dance troupes. The thread which ties everything together is creating a platform from which people can tell their own stories. In my more recent work I am finding myself getting back to image making with little or sometimes no text at all. This is leaving more space for the viewer to think independently. My solo show at London's p21 Gallery last summer included a film installation through which 9 interviews with displaced Palestinians were projected simultaneously. All interviews were in Arabic with English subtitles. The initial confusion this audio-visual 'wall' created left the viewer with 2 choices - either walk away because you don't understand; or really spend time focusing on different bits of film and join the dots together. I am attempting to question our levels of responsibility to each other with such work - are we willing to spend the necessary time listening to people to understand their own stories or would we rather remain blind and deaf? I understand you are also working on various long-term projects at the moment. Can you please tell us more about this work? My long term body of work explores Palestinian complexities of 'home' and 'identity'. Within this wider context there are various projects, which examine these issues in different ways. 'Home and Exile' looks at the Palestinian 'experience' of displacement. Part of this work was produced in partnership with BADIL Resource Center, a Palestinian NGO which specialises in refugee rights and displacement. 'Home and Exile' avoids the moment of high drama - the house demolition for example - instead exploring the human experience in the time before or after, or maybe the space left behind. 'Workers' explores the Palestinian context of a traditional documentary subject. Rather than exploring the mass of workers that Salgados incredible work focussed on, this looks closer at individuals whether workers in threatened traditional industries, shopkeepers at risk of eviction, or people trying to reach their workplace via Israeli checkpoints. Recently, a Palestinian worker told me; "If a man has work he can live, he can provide for his family. Without work we have nothing, no future." These words encapsulate this project much better than mine ever will. 'Turning the Clock Forward' explores the 'return' of two displaced Palestinian communities inside today's state of Israel to the villages from which they were displaced in 1948. In recent years the displaced communities of Kufr Bir'im and Iqrit implemented their own 'return' pro-actively by establishing tented camps in their villages. The state has demolished their camps on various occasions and launched a case in the Israeli Supreme Court for eviction. This project questions what 'decolonisation' may mean in today's world. I am also developing 'Bubble' (soon to be published online) which examines the Palestinian Authority's attempts at 'state building' whilst under occupation in the PA stronghold of Ramallah - the 'Bubble'. This political development, demanded by the 'international community', can only be implemented in the tiny dislocated areas of the West Bank under PA control. Construction and institution-building are taking shape yet living costs are rising out of control, debt is growing rapidly amongst the majority and grassroots political activism is restrained by Israel-PA 'security coordination' policies - are these really steps towards 'freedom' or rather new layers of control that are being established? Lastly, who are your photographic heroes? Heroes is not a word I use lightly, but amongst the photographers who I admire most are people like Don McCullin and Sebastio Salgado, for their combination of aesthetics and sheer dedication and humanity. McCullin's work in particular was a strong driving force behind my early work and directions I took. I don't get enough opportunity to see exhibitions these days, but one that affected me a lot was Simon Norfolk's 'Chronotopia' series. Simon Norfolk's work is very different to the more traditional black and white documentary work I admire, and it encourages me to consider different ways of thinking about issues. I have followed his work closely ever since and seeing my name alongside his on the World Photography Awards shortlist was particularly poignant as I thought back to the effect Chronotopia had on me when I first saw it.